I’ve noticed the last few years that students seem to bring a slightly higher degree of beginning presentation skills into the classroom. I suspect this comes from growing up surrounded by hundreds of cable channels and YouTube. It has even reached the point where the old saw about public speaking being the number one fear is no longer true. I thought perhaps it was, indeed, a steady trend of increasing confidence. If so, this semester doesn’t fit the trend. In fact, students have generally had more trouble with the second speech round than the first speech round. I have been thinking about why several students seemed to have greater anxiety on the second speech round. Here are some thoughts around that. To some degree, you just have to get used to speaking. It’s like the high-diving board that graced the public pool at my high school (a loooooong time ago). The first time I went off that thing, fear froze my feet to the board, but after I survived the first foray, I immediately lined up to go again. Likewise, a lot of “stage fright” is really just fear of the unknown. “New situation” is a way of looking at things, not a matter of reality. In a way the first speech round wasn’t so different from everyday communication. Sure, they had to stand in front of an audience, but since the first speech didn’t involve much research (and some ignored the minimal research requirement, so they spent the whole speech just talking about themselves), so it didn’t feel like a new situation. When the next round required research, it became “a new thing,” even though it wasn’t the first time in front of an audience. Build confidence by over-researching. 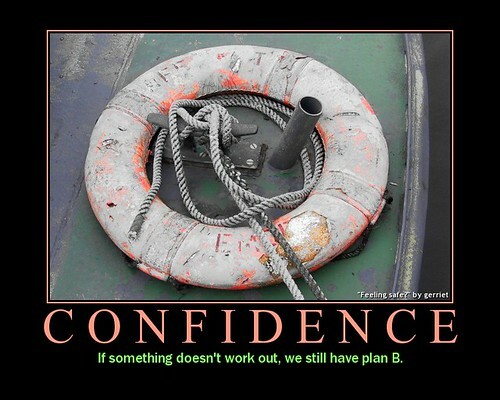 Confidence partly comes from knowing that you know what you’re talking about, so you can handle whatever comes up. In the speech round debriefing, several students confessed to not having prepared enough. On top of “normal” college procrastination, several failed to realize how much time speech preparation really takes. They wound up short on time, and short on depth. Narrow your focus and develop fewer points in greater depth. Narrowing your focus enables you not only to develop depth of support, but also the confidence that comes from knowing that you know what you’re talking about. It takes a lot of time and effort to become an expert on a broad topic. When you have narrowed your topic, you can have the confidence of knowing you know more about that narrow slice than anyone else in the room. Broad leads to rambling, disorganization, and shallowness, which saps confidence too. Focus on the audience instead of yourself. Care enough about the audience to make the information relevant to them. Students who find a passion within the topic, whether one they pick or one they’re assigned, and then focus on getting the point across to the whole audience find themselves more comfortable and more confident. Confidence, for the most part, isn’t something you can just have. It comes as an effect from other actions and decisions. These are just a few of them that you can control.